Dr. Albert Rossi discusses the difference between introverts and extroverts. Dr. Albert Rossi reflects on the topic of leisure and invites us to consider how to use our leisure time to restore our souls. 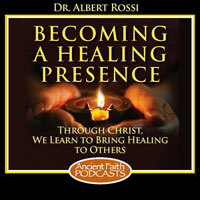 Dr. Albert Rossi explains how we can live in the awareness that "all is well" in the middle of a troubled world. Dr. Rossi once again interviews Fr. Sean Levine, a graduate of St. Vladimir's Orthodox Theological Seminary and now chaplain in the United States Army, regarding Family Systems Theory and how it applies to our healing the growth. Today Dr. Rossi interviews Dr. Jane (Carnahan) Hinshaw, a Clinical Instructor of Psychiatry at the University of Michigan Health Care System. She is also an Orthodox Christian. They discuss mental health, medicine, and therapies designed to help those struggling. In November of 2013, Dr. Rossi interviewed Sarah Najjar who was suffering from cancer. Sarah fell asleep in the Lord in August of this year and Dr. Rossi has returned to the microphone to reflect on illness. Today, Dr. Rossi interviews a wife and mother of two small children who is fighting cancer and has gone through several surgeries, treatments, and procedures. What can be learned from such an experience and where does God come into the picture? Dr. Rossi talks about the book God's Path to Sanity by Dee Pennock.